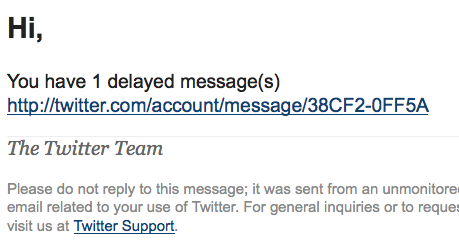 I received an email purporting to be from the Twitter Team informing me I have a delayed message. But I know better since I have never used my Twitter account. (My 10 followers, all consummate optimists, are still hanging in there.) Anyway, I mouse over the link to see what it really points to. The link points to http://vista.lk/ which Google informs me tries to download 10 different scripting exploits. Some people who do use Twitter may be very tempted to click on the link and suffer some unfortunate consequences. Skepticism is a necessary component in life. wow, I recieved one of those also. 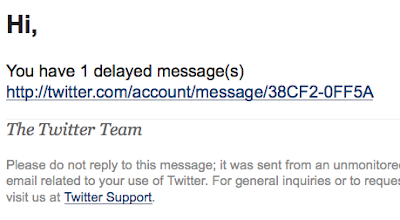 Considering I don't even know how to use twitter, I figured it was bogus.